Get the Most Out of Your Visit to Munich. 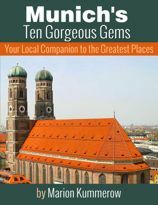 This guide covers the 10 most spectacular places in Munich. Whether you're on a one-day, two-days or longer trip, the guidebook gives you the necessary information to make the most of your time. With this guide book you won't have to regret that you missed best spots, ran out of time or arrived at the museum just when it was about to close. Everything you need to know about the Oktoberfest in Munich. 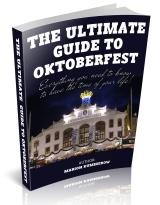 The book includes a detailed description of all beer tents, how to make a reservation and even secret tips on what to do if you don't have a reservation. The only guidebook you will ever need! 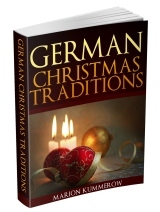 A comprehensive book on German Christmas traditions with very personal views from the author who was born and raised in Germany. 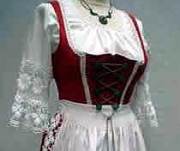 Here you find everthing you always wanted to know about German Christmas, including four of the best Christmas Cookie recipes and the lyrics to three famous German Christmas Carols. 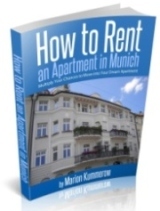 The detailed step-by-step instructions in How to Rent an Apartment in Munich: Multiply Your Chances to Move into Your Dream Apartment map out your move to Germany for you. The helpful glossary of German words will help you communicate with lessors. Disclosure: Some links on this page are affiliate links. When you buy a product through one of these links, for example at Amazon.com, I earn a small commission. This money helps me to maintain this website and provide the free information for you. Thank you for your support.